While there have been numerous changes across the 690-acre campus of Baylor School over the past five decades, there has been a singular figure of consistency that has become synonymous with the institution’s quest for excellence. Dr. Dan Kennedy, who will retire as a math instructor this May after 46 years at Baylor, has served as an iconic fixture among the school’s faculty. 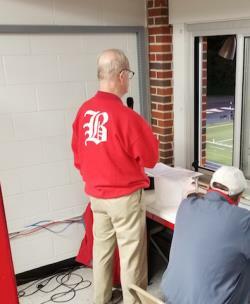 But Dr. Kennedy’s influence extended well beyond the classroom, his inimitable style and quick wit on display as the long-time voice of Red Raiders athletic events. The native of Rochester, New York, has manned the public address microphone for Baylor basketball for the past 45 seasons. He’s also announced Red Raiders football for 37 years as well as lending his talents to Baylor’s softball program for more than two decades. While Dr. Kennedy’s extensive tenure in the classroom draws to a close, he has accepted an invitation to continue his role behind the mic with Baylor athletics into retirement. He will also devote more time to the five math textbooks – ranging from Calculus down to Algebra I – which he has co-authored. Dr. Kennedy’s comfort behind the mic found its origins during his undergraduate years while attending Holy Cross, a Jesuit university located on the outskirts of Boston. It was there he spun discs as a deejay with the campus radio station, eventually earning the role as station manager. Dr. Kennedy later matriculated southward, earning his master’s and doctorate degrees in math at the University of North Carolina. Dr. Kennedy initially sought teaching jobs at the collegiate level after completing his studies when he was given a pearl of wisdom that altered the trajectory of his life. “In the ‘70s there weren’t a lot of openings at universities and colleges partly because of the (Vietnam) war. People wanted to make sure that if they were inside the ivied walls, they were protected by the ivied walls. So, it was very popular to be in education in those days as there was usually a draft deferment for teaching faculty. Dan Kennedy’s first visit to Baylor’s stately campus made a lasting impact. “I had never seen a high school like this. I walked across the campus and thought to myself, ‘I could be happy for a few years at this place,’” he said, never dreaming he would spend his entire teaching career at there. 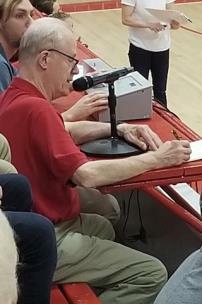 It was in 1974, his second year at Baylor, that he was approached by basketball coach Jimmy Duke and assistant Doug Hale about taking on the role of PA announcer. Dr. Kennedy had garnered a love for basketball while at North Carolina, but he quickly found himself on a learning curve while in the public eye. 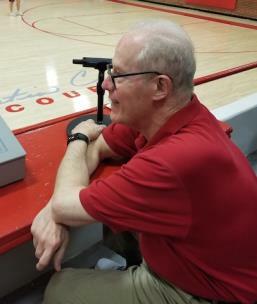 After Jimmy Duke retired from coaching in 1980, Austin Clark assumed the helm of the basketball program two years later. His coaching tenure at Baylor spanned 36 seasons before stepping down last year. Dan Kennedy’s appreciation for Austin Clark blossomed during the overlap of their many years with Baylor basketball. 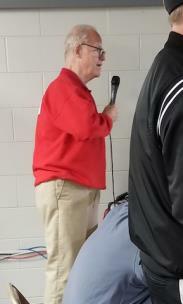 Dr. Kennedy has witnessed countless buzzer-beaters and historic moments during his time with the Red Raiders, but he points to the era in the late ‘70s as some of his fondest memories. It was during Braddock’s recruitment in 1979 that Dr. Kennedy had the opportunity to meet legendary Tar Heels coach Dean Smith. Those were before the days when a separate division was created for the private schools within the TSSAA, and Dr. Kennedy relishes the memory of those cross-town rivalries. During his early years at Baylor, Dan Kennedy toyed with the idea of teaching at the college level and eventually had offers to serve as headmaster at other schools. But after receiving the Cartter Lupton Distinguished Professor of Mathematics award in 1981, he realized he had found a permanent home. Dr. Kennedy lived on campus for 27 years as a dorm parent in Lupton Hall, where he baked a cake for each resident on his birthday. 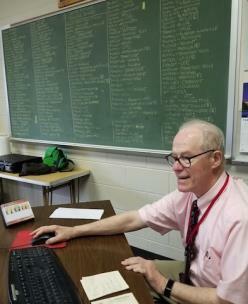 He chaired the math department for 18 years and received the 1995 Presidential Award for Excellence in Science and Mathematics Teaching. 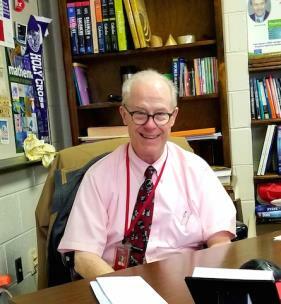 From 1986 to 1994, he served as one of six members of the Advanced Placement Calculus Development Committee, becoming the first high school to chair the committee his final four years. Dr. Kennedy has always viewed his involvement with Baylor athletics as another investment into the lives of his students. His classroom features the lone remaining chalkboard on the campus, on which he draws out the bracket for the NCAA basketball tournament each March. While Dan Kennedy’s retirement will leave enormous shoes to fill on Baylor’s faculty, he has no plans to give up his announcing gig anytime soon. It’s unlikely that anyone will be able to exceed Dan Kennedy’s contributions to Baylor, either in the classroom or elsewhere. For the past 46 years, his influence has helped shape the lives of countless students as well as those who were fortunate enough to call him a friend.